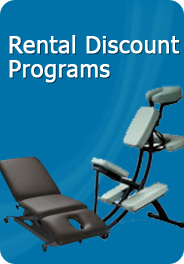 At MassageTableRentals, we work with health and cosmetology professionals, media companies, professional event planning agencies, associations, and conference coordinators every day. We know that updates and clear information about your rental matters. Online ordering provides you with immediate detailed confirmation of your order, including dates and equipment selected. Once your order is received, we spring into action and add the first two messages to your order detailing the Shipping Plan and Pickup Plan for your rental. Look for helpful links in these messages in case you need to log into your account for any reason, or need to add a pickup. packing, labeling, pickups, and drop-offs. For local courier deliveries, we confirm the carrier and contact plans along with the phone number for the service. Once your order ships, you receive a Shipping and Tracking email from us. You can use the tracking to check on transit as needed by Googling the carrier (such as FedEx Tracking) and pasting the tracking into the box for detailed scans on the package. If you scheduled a pickup, we will note your order to confirm packages are ready if there are any Return Pickup Exceptions or other problems. We also update you once the equipment arrives back at the warehouse for inpsection. If there are any lost, late or missing items we will communicate with you on the order notes as well, so you have records of the rental details. All of these messages add up to an effective and thought-out communications process we have refined over 10 years of renting and shipping equipment. We strive to make things as smooth and stress free as possible by keeping in touch with you throughout the rental process. To ask a question or confirm details, simply reply to any of the order emails and our customer service team will reply quickly. We keep a close eye on this email box, and our operations team values your communication. We appreciate your choosing us to work with you on your events, and will continue to deliver value to you as you rent with us!